The Not-So Angelic Doctor: Get Your Blessed Chalk! Your Epiphany Water! And Your Theophany Water! Get Your Blessed Chalk! Your Epiphany Water! And Your Theophany Water! So even though I've been a Catholic all my life, it wasn't until yesterday when I finally realized just how AWESOME yesterday, January 6th, is. In the Western Church, we call this day the Feast of the Epiphany. 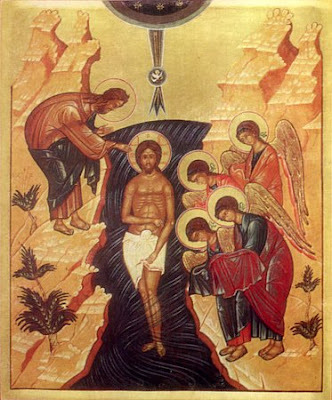 In the Eastern Church, we call this day the Feast of the Theophany of Our Lord. Basically, they're both celebrating the same thing. And we as Catholic Christians get a LOT from Holy Mother Church on this day. Sitting in the pew yesterday, I felt like I was almost at a baseball game, the way we were just getting free sacramentals, blessings, and most importantly of course, the Eucharist! Apparently, the Church, both East and West, have very rich traditions regarding this feast. And you may even be surprised to know what we are actually celebrating on this Holy Day... because it's just not the arrival of Casper, Melchior, and Balthazar. First, we should take a look at what these two words, "Epiphany" and "Theophany" actually and truly mean. Often when someone has that "A-HA!" moment, it can be referred to an epiphany. However, in the theological sense, the word means "manifestation". As for Theophany, it's very similar, and translates more specifically to "vision of God." Obviously, a vision and manifestation are synonyms, but it seems the Eastern Churches detail it a little bit better with calling their celebration the Theophany. We celebrate a holy day adorned with three mysteries: this day the star led the Magi to the manger; this day wine was made from water at the wedding; this day Christ willed to be baptized in the Jordan by John in order to save us, alleluia. 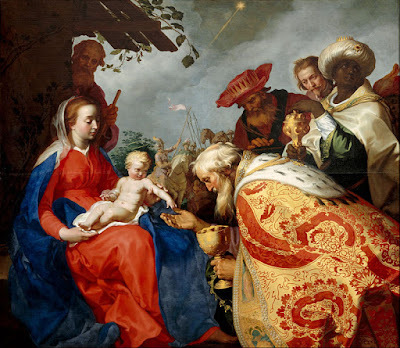 Now in 1955, a specific feast for the Baptism of the Lord was added to the Roman Calendar, thus weakening the connection of the Feast of the Epiphany to the Lord's Baptism. Still, to this day the Latin Church still celebrates all three of these revelations of Christ's divinity on the Feast of the Epiphany, even though the emphasis is on the visit of the Magi. However, where things really get interesting for this feast, are where the special blessings come in, and they are truly a sight to be hold if you're lucky enough to be at one of these sacred rites. Bless, O Lord God, this creature, chalk, and let it be a help to mankind. Grant that those who will use it with faith in your most holy name, and with it inscribe on the doors of their homes the names of your saints, Casper, Melchior, and Balthassar, may through their merits and intercession enjoy health in body and protection of soul; through Christ our Lord. Another cool thing that gets done is the blessing of the gifts of the magi: gold, frankincense, and myrrh. I don't know how many people have myrrh in their possession, but it's pretty cool that the Church has specific prayers for the blessing of these objects on this specific day. This blessing comes from the Orient, where the Church has long emphasized in Her celebration of Epiphany the mystery of our Lord's baptism, and by analogy our baptism. This aspect is not neglected in western Christendom, although in practice we have concentrated on the visit of the Magi. 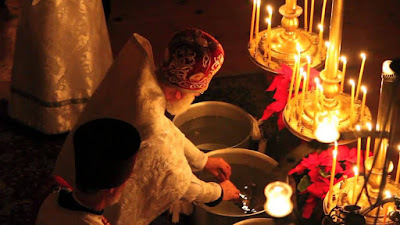 Many years before the Latin Rite officially adopted the blessing of Epiphany water, diocesan rituals, notably in lower Italy, had contained such a blessing. So what exactly do the Eastern Churches do? Well, I was able to experience this beautiful tradition firsthand this past Tuesday at the local Byzantine (Ruthenian) Catholic Church. I had no idea what I was in for. I just jumped at the opportunity of attending a 7pm Liturgy on a weeknight, since all of the Latin parishes had already celebrated the Epiphany. When I got to the church, I soon found out how important of a feast the Theophany is for our Eastern brothers and sisters. Apparently, this is only one of four times each year the Divine Liturgy of St. Basil is said. So this was my first time experiencing this. Prior to the Liturgy, Vespers was offered, and it was lovely to hear the polyphonic chant. After the Liturgy came the blessing that the Roman Missal alludes to. It's called "The Great Blessing of Waters"
According to the pastor, this is where we get to come in contact with the same waters Christ was baptized in. In the prayers, the Holy Spirit is invoked, just as He is in the epicleses, to descend upon the matter (the water). 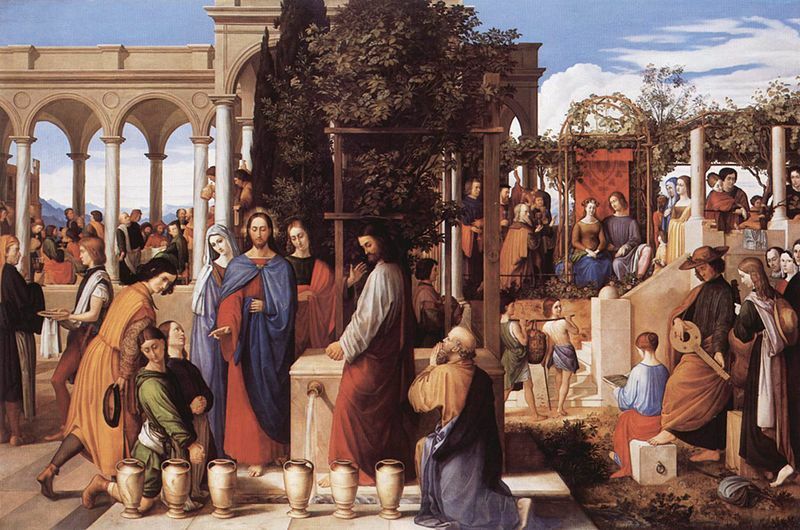 Father emphasized that the water wasn't merely blessed, but that the water had become the same water from the River Jordan that Christ was baptized in. There doesn't seem to be a parallel in the Latin Church that I could find, but more information can be found in this Byzantine Catholic prayer book. The properties have changed such, that the water becomes incorrupt, does not spoil, and remains clear and transparent after several months, even years! St. John Chrysostom himself attested to this in one of his homilies. This water is then used throughout the year by the faithful. This ranges from the usual manner of blessing one's self through the Sign of the Cross, to swimming in it (when a great body of water is blessed), to even drinking the water. Many Eastern Christians start their morning prayers off with a sip of this water each morning. ...that these waters may be sanctified by the power, and effectual operation, and descent of the Holy Spirit, let us pray to the Lord. That there may descend upon these waters the cleansing operation of the super-substantial Trinity, let us pray to the Lord. That he will endue them with the grace of redemption, the blessing of Jordan, the might, and operation, and descent of the Holy Spirit, let us pray to the Lord. That Satan may speedily be crushed under our feet, and that every evil counsel directed against us may be brought to naught, let us pray to the Lord. That the Lord our God will free us from every attack and temptation of the enemy, and make us worthy of the good things which he hath promised, let us pray to the Lord. That he will illumine us with the light of understanding and of piety, and with the descent of the Holy Spirit, let us pray to the Lord. That the Lord our God will send down the blessing of Jordan, and sanctify these waters, let us pray to the Lord. That this water may be unto the bestowing of sanctification; unto the remission of sins; unto the healing of soul and body; and unto every expedient service, let us pray to the Lord. That this water may be a fountain welling forth unto life eternal, let us pray to the Lord. That it may manifest itself effectual unto the averting of every machination of our foes, whether visible or invisible, let us pray to the Lord. For those who shall draw of it and take of it unto the sanctification of their homes, let us pray to the Lord. That it may be for the purification of the souls and bodies of all those who, with faith, shall draw and partake of it, let us pray to the Lord. That he will graciously enable us to perfect sanctification by participation in these waters, through the invisible manifestation of the Holy Spirit, let us pray to the Lord. The priest then took the triple candle, and dipped each stick into the water jugs, saying a prayer. He then followed this by dipping a cross in each. More blessings were said over the water. Then, the ushers came out with two more tables on either side of the iconostasis, and took a pitcher and dipped it into the holy water, and then proceeded to pour the water from the pitcher into small plastic cups for the faithful to drink. As this was happening, the priest then blessed some holy oil which he later anointed us with. Before we all had a chance to drink the holy water, we came up to venerate the cross that the priest was holding and be blessed with the holy water. However, instead of being sprinkled I was drenched, and I suppose this is because I was blessed with a very large basil leaf. Apparently, I found out later, that the word basil or βασιλεύς (basileus), means "king". Very fitting, and very cool indeed! The entire thing lasted two hours, but I loved every moment of it. Next time, I will be definitely be taking my family along with me, and I was so glad to learn more about this important feast. I'm hoping all have learned a new thing or two from reading this as well. Now everyone will know that next year, we better all be clamoring for our Epiphany/Theophany Water, and bring some chalk and gold to get blessed as well!